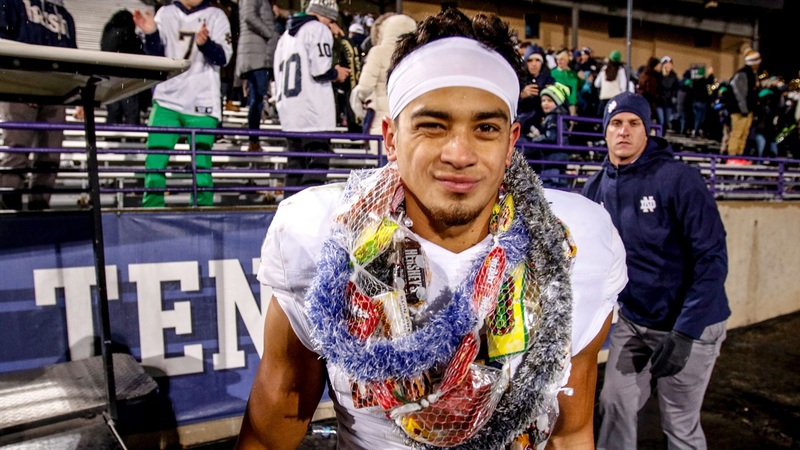 Alohi Gilman: "If you hit them first, you won’t hurt as much as they will"
Notre Dame safety Alohi Gilman sat out last year while the Irish were in contention for the College Football Playoff, but the Hawaii native admits this year’s team is different and it starts with a cohesiveness within the team. The Irish will lean on its leadership on Saturday as starting quarterback Ian Book will miss Saturday’s Senior Day against Florida State. Gilman knows the defense will need to step up and lock in despite the Seminoles entering the game with a 4-5 record. Saturday’s game was circled on the calendar of many college football fans at the beginning of the year, but Florida State has taken its lumps over Willie Taggart’s first year in Tallahassee. The 5-foot-10, 202-pounder admitted he was surprised the Seminoles have struggled, but it doesn’t change his mindset heading into the game. Cold weather will inevitably impact Saturday’s game as the high will be 32 degrees. While Florida State might not be used to the cold temperatures, Gilman has some simple advice for those who haven’t played in the cold. Gilman will also have the chance to see some familiar faces this weekend as his younger brother, Alaka'i Gilman‍, will be in town for a recruiting visit.